Duke Nukem: Episode 3 - Trapped in the Future is the final episode in a Duke Nukem trilogy and was developed and published by Apogee Software in 1991 for DOS only. The game utilizes the same engine as the game Crystal Caves. It follows Episode 1: Shrapnel City and Episode 2: Mission: Moonbase. The game picks up the story from the previous 2 episodes, where the evil Dr. Proton has run off like a scared kitten after being defeated. This time he has gone into the future to create his evil robot army to take over the world. Duke finds himself launched into this future and he needs to find a way to take out Dr. Proton and end the madness. Episode 3 plays a side-scrolling shooter and it’s Duke’s job to destroy everything in his path. There are multiple enemies to kill and mystery boxes to break open. Be careful, though, not every mystery box is beneficial to you. 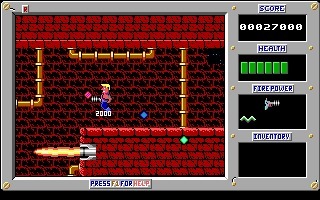 Duke has to traverse each level and pick up items to gain points and upgrade himself or his weapons, before making his way to the next stage. Every level has many obstacles and traps to avoid, as well as hidden rooms to discover. Duke Nukem: Episode 3 closes out just one storyline in the Duke Nukem gaming franchise which is incredibly expansive. The series has been around for quite a while and this is a great way to enjoy some classic Duke Nukem.